Exclusiveness is the key of differentiation and this is the only factor, which creates a separating line in between a regular one and a luxurious one. Common services are provided by anyone, but what counts is the special services and exclusive use which makes someone stand ahead in the crowd. Along with being a residential place with royal touch, Shiv Vilas provides a number of exclusive services which are generally hard to find anywhere else. 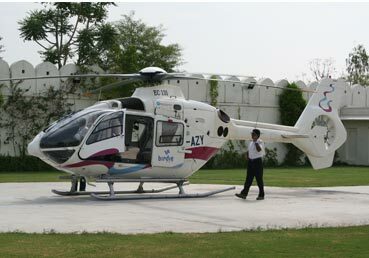 One such exclusive service provided by Shiv Vilas is the helipad which allows its royal guest to land on the royal palace. If you want to make your journey comfortable, avoiding the traffic of the city, just arrive with your private chauffer and land right at the Shiv Vilas.